Are we really ready to talk to robots? Despite consumers’ likelihood of adopting AI in the near future, some businesses seem less keen on the technology. Whether you are operating in the retail or automotive sector, it is more than likely that Artificial intelligence (AI) will soon be revolutionising the way you do business. We have all been surprised at how quickly long-standing, established high-street retailers such as WHSmith, House of Fraser and M&S have come under existential threat as the number of agile e-commerce players has risen. At the heart of these organisations’ woes lies a failure to provide customers with the experience they want – and increasingly require. And that is just as much a threat to a business’ online presence as it is to their bricks-and-mortar stores. In today’s rapidly advancing digital landscape, consumer-facing organisations are beginning to adopt AI in order to remain competitive and keep up with increasing customer expectations. But with AI becoming somewhat of a buzzword, it is important to recognise its true value and the part it has to play in enhancing the customer journey. The Internet is no longer young, and e-commerce has matured to a point where the market is not merely full but overcrowded. As these digital business models have evolved, so have consumers’ expectations. Thus, online operators who don’t keep pace with changing attitudes are beginning to stagnate – and are feeling the adverse effects of this upon their business. In this way, the digital marketplace shares the woes of bricks and mortar; just at a different point in its lifecycle. Savvy businesses must therefore act now – so as not to become another example of a once-successful organisation failing to adapt. Where businesses are falling short is customer experience. Consumers, in an increasingly digital and saturated marketplace, have an increasing expectation for their transactions to be instantaneous, immersive and entirely seamless. As this becomes the norm, consumers’ needs will continue to evolve – the next holy grail is great customer service that not only meets, but also predicts, their needs and responds accordingly. Only data-driven insights will be able to facilitate this process, with AI and machine-learning moving in tandem with purchasing habits, and instantly identifying – better yet, anticipating – and meeting consumers’ needs. According to PwC’s Global Insights Survey 2018, which surveyed more than 22,000 consumers worldwide, customers are happy to talk to robots. Brands must convince customers that they are authentic and caring in order to thrive – and though it may seem counterintuitive, AI could lie at the heart of this. AI can increase the human element to customer service – allowing businesses to offer the very best of human one-to-one service, in an online space. In fact, 60 per cent of respondents in the survey agreed that AI can reduce the time it takes to get answers while being highly tailored to their preferences. In many cases, AI provides a great solution, and there is clear evidence that not only are customers perfectly happy ‘talking to robots’ – hence the rise of apps like Siri and Cortana, and devices like Amazon Alexa and Google Home – but they actually plan to do so more often. 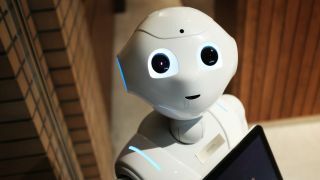 PwC found that while just 10 per cent of respondents owned an AI device at the time of response, nearly one in three had plans to purchase one, and 18 per cent of AI device owners associated ownership of that device with shopping behaviours. However, despite consumers’ likelihood of adopting AI in the near future, some businesses seem less keen on the technology. Of course, the fundamental problem here is that if organisations cannot meet their customers’ needs – in the way they prefer – those potential buyers will go elsewhere, just as we have seen with high street brands. Here, the benefits of AI are clear; it offers far more than just customer service and client retention. Interaction and conversations between humans and brands become more productive for both parties with AI-enabled technologies. This is because they combine artificial intelligence and data to provide analytics – learning from and responding to a slew of data points in a way that no human ever could. With this analytical insight available, a call centre agent can provide the empathetic, responsive service that customers appreciate – and, increasingly, require. For example, it is relatively straightforward for a good AI application to analyse the past and recent purchasing behaviours of individual clients, combine this understanding with wider machine learning in various data sets and come up with rational predictions of future behaviours. This lets businesses plan, make investment decisions, build marketing plans and generally arrange their operations in response to these insights. It’s a win-win: consumers get a customised service, and the business gets a healthier bottom line. The business can quickly and easily customise special offers and promotions to the individual, and clients will be happy and ready to spread the good news on social media and elsewhere — at which point AI can analyse that, too! Another strength is the power of AI to analyse, more or less instantly, processes and behaviour paths and identify areas of weakness or failure, so that vendors can eliminate these and refine processes to better suit the customer. Currently, AI offers so many forms and applications, it is difficult to imagine a sector that can’t benefit from it. However, if we take a slightly more prosaic definition of AI as ‘technology doing things that humans do, in apparently human ways’, then any business that conducts substantial sales or marketing online has much to gain from the more widespread applications of AI. That’s because it effectively makes (super)human customer service available 24/7. Much like the telephone, or even the desktop computer, AI will soon become part of everyday business. The pressure is now on for organisations to embrace the power of AI and equip themselves with the technology needed to predict future customer needs and provide a seamless customer experience. Those businesses that fail to meet the growing expectations of their customers, will risk falling behind the competition. Those who will survive will be the companies that are already incorporating AI technology throughout their organisation. As a result, these companies will see increased customer satisfaction and growth in their customer base.